Although Wyatt has autism and other intellectual and developmental disabilities, he is continually excelling at Little City’s ChildBridge Center for Education—a leading-edge therapeutic day school. Wyatt is one of the four students utilizing new technology and improving his skills with different educational applications (apps) on an iPad. The ChildBridge Center for Education, located on Little City’s 56-acre Palatine campus began using an iPad in the classroom six months ago in order to help students achieve their goals and monitor their progress. Little City is one of the few schools in the district leading the way in usage of this technology. “iPads have revolutionized the way I approach therapy,” stated ChildBridge Center for Education Occupational Therapist Damon Simmons. Damon, an occupational therapist of nine years, originally bought an iPad for his own recreational use, but then discovered ways it could compliment the skills he was teaching during his therapy sessions. 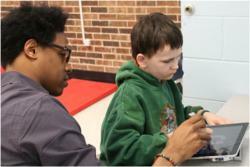 Damon uses his iPad at the therapeutic day school because it is a multi-purpose tool. “My iPad replaces a lot of things while serving many purposes. It can play music and become a leisure activity, it acts as a paper and pencil task, replaces worksheets and can be an interactive book,” added Damon. For example, if Wyatt becomes upset or distracted, Damon can turn the iPad into a self-calming tool by playing music. Once Wyatt is relaxed and has the proper level of alertness that is needed to learn, Damon will go back to using educational apps that target accuracy and control. “I don’t believe iPads should replace other ways of teaching, instead they should be used to enhance lessons by giving students quick access to programs that require the skills they are learning,” said Damon. The time spent using iPads keeps them engaged while reinforcing the movements and fine motor skills they were taught at the beginning of their session. Wyatt has shown major improvements by using an iPad. He started by using his finger to interact and practice writing letters, but has since improved his fine motor skills and now Wyatt has the ability to use a stylus, which acts as a pen. His visual skills have also greatly increased; Wyatt only has one working eye which makes visualizing and focusing on objects more difficult. In addition to these improvements, Damon has discovered that students have an increased attention span while performing paper and pencil tasks that they are normally averse to. Since iPads are interactive and engaging, students will sit for longer periods of time working on the task. Currently, students at the ChildBridge Center for Education use iPads twice a week for the last ten minutes of their occupational therapy sessions. Students are allowed to pick from a predetermined list of educational apps that range from puzzles and interactive books to drawing and writing letters. Thanks to a generous donation from Plexus Manufacturing Solutions, Little City will now provide iPads to each student. These iPads will not only be occupational therapy tools, but will also give students who are nonverbal a voice by acting as their communication tool. For referrals, please contact Admissions at school(at)littlecity(dot)org or 847-221-7859. Stay up to date on the latest happenings at Little City by visiting our Facebook page. To support individuals with autism and other intellectual and developmental disabilities, visit http://www.littlecity.org/support. For more than 50 years, Little City Foundation has developed innovative and personalized programs to fully assist and empower children and adults with autism and other intellectual and developmental disabilities. With a commitment to attaining a greater quality of life for Illinois’ most vulnerable citizens, Little City actively promotes choice, person-centered planning and a holistic approach to health and wellness. Little City’s ChildBridge services include in-home personal and family supports, clinical and behavior intervention, 24/7 residential services and special needs foster care and adoption. Little City’s LifePath Adult Services offers a variety of residential options, employment opportunities, home-based services, case management, day supports, Special Olympics, an award-winning Center for the Arts and more. The organization has a 56-acre campus in Palatine and offices in Chicago. Visit http://www.littlecity.org.